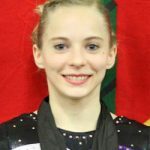 Mykayla Skinner is one of the few returning competitors from the 2010 Nastia LiukinSupergirl Cup. At the time she was just 13 years old, and finished an impressive seventh in the all-around competition and fifth on vault. This year, she is looking forward to using the experience she has gained during the past year to go even further in the competition.